The Collection of Decisions of the Judicial-Legal Council on conduct of Judges is published and distributed to all Judges and other bodies accordingly. The target of the publishing issue is ensure Judges to be familiar with Judges’’ conduct decision and attain their avoid from infringements of laws, not let them inflict loss on prestige of justice, honor, dignity of judge name. "Ədliyyə" (Justice) is being published since 2004 year. Significant sociopolitical events that occur in the country, writes about activity of justice and Judiciary, the state registration of legal bodies, interpretation of the legislation on commercial activity and other materials are published on the Paper. 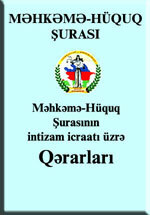 "Qanunçuluq" (Rule of Law) Journal is being published since 1966. It reflects steps made in the field of democratic, legal state creation, progress of Judicial legal reforms and its results, activity of courts, justice, prosecutors and other law enforcement authorities, measures taken in the field of human rights. In this magazine the articles of well-known scientists and lawyers, the topics on justice history, judicial practice, as well as new adopted laws, decrees and other legal acts are published. 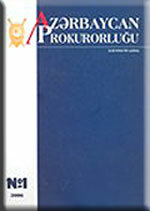 First time in the history of Prosecutors’ Office of Azerbaijan Republic is being published "Azərbaycan Prokurorluğu" (Prosecution of Azerbaijan) practical-scientific journal, since May of 2003 year. The society is informed by the journal on reforms carried out in the prosecution, propaganda scientific basis of organizational works of the prosecution. 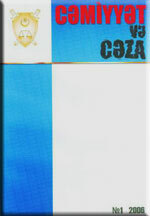 "Cəmiyyət və cəza" (Society and Punishment) Journal is being published since 2000 by the Chief Department for Execution of Court Decisions of the Ministry of Justice. The Journal highlights, inter alia, publications on functioning of penitentiary system in the country, reforms in this area, ensuring prisoners' rights, improvement of their detention and living conditions, measures taken towards protection of their health as well as cooperation with international and non-governmental organizations as far as human rights protection is concerned. Resumes of the major articles are published in Russian and English. 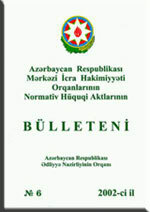 "Bulletin of the Acts of Central Executive Authorities of the Republic of Azerbaijan" is being published since 1997. Legal acts of central executive bodies, which passed through the legal examination and registered with the Ministry of Justice, are published in the Bulletin. According to the law "On Legal Acts" legal acts come into force only after being published following their state registration unless otherwise is stipulated therein. 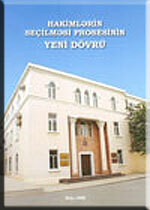 "Bulletin of the Legal Acts of Local Self Government Authorities" is being published since 2003. 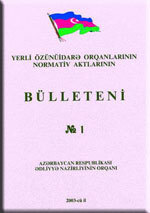 The Bulletin covers legal acts of municipalities which having been passed through legal examination are registered with the Ministry of Justice, as well as articles devoted to the functioning of municipalities, theoretical and practical publications, methodical manuals and other papers serving to raising legal awareness etc. 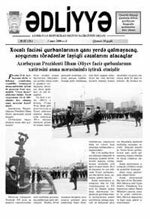 "The New Age of Judges’ Selection" On the eve of 90th anniversary of Azerbaijan Justice, this publication was printed, to show procedures on selection of candidates to judge post just as a link of assignments of the President on increasing of efficiency of justice, and informs the society about implementation of new and unanalogous rules of Judges’ selection. 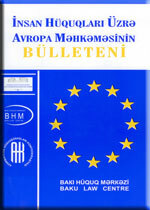 "The Bulletin of the European Court of Human Rights" is monthly-published journal in language. Decisions of the European Court of Human Rights on violated provisions of the European Convention for the Protection of Human Rights and Fundamental Freedoms are represented in the Bulletin. The Bulletin has special significance on reforms that carried out with regard to increasing of efficiency of justice and learning of precedent law of the European Court by Judges. "Handbook of Judge" The issue "Handbook of Judge" is drafted by Confederation of Azerbaijan Lawyers with close assistance of Judicial-Legal Council and published due to grant supported by Council of Governmental Support to NGO’s under President of Azerbaijan Republic. Target points of the issue are judges, candidates to the judicial post and judicial public. "Handbook of the law-enforcement body officer on human rights" The issued book is drafted by Confederation of Azerbaijan Lawyers and published due to grant supported by Council of Governmental Support to NGO’s under President of Azerbaijan Republic. Target points of the issue are officers of law-enforcement bodies, lawyers, judges, advocates and judicial public. "Legal acts on combating against corruption"
Legal acts on combating against corruption. Acts, Decrees, Orders, International treaties, Decisions, Directives. 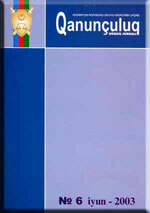 This Digest has been prepared by the Commission on Combating Corruption of the Republic of Azerbaijan.